I have travelled across the world, seen many wonders and beautiful places but none compares to Angkor Wat. Theres no place that comes even closer to the beauty and magnificence of this wonderful temple complex. 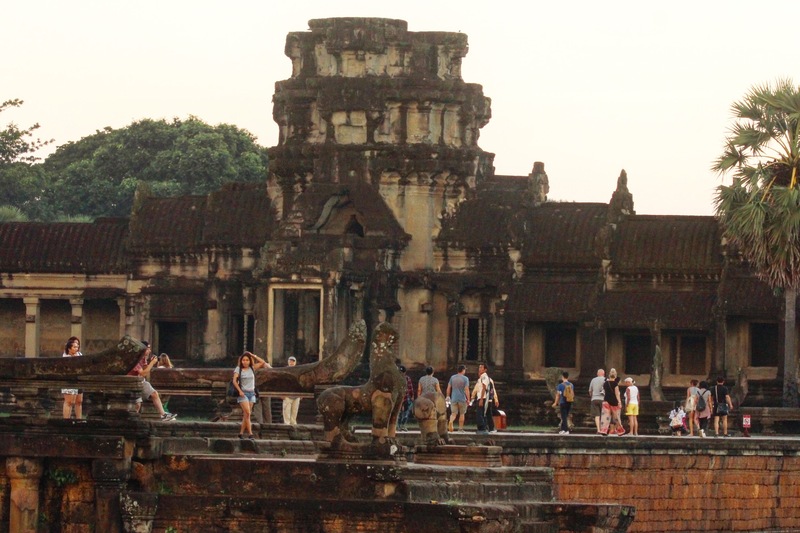 Angkor Wat was once the center of the Great Khmer empire that ruled most of Southeast Asia. This ancient cilvilazation went extinct, but not before building amazing temples and buildings that were later reclaimed by the jungle for hundreds of years. I knew visiting this temple once is not going to satisfy my appetite for ancient architecture and history, neither would it do justice to its beauty and craftsmanship. Hence I decided to visit it once in the evening after completing my trip to Bayon, Prasat Kravan etc on day two of my tour.It was evening when we reached Angkor Wat and the first look of its beauty and grandeur made me speechless. Falling light and colours of the evening sky enhanced its beauty many folds. 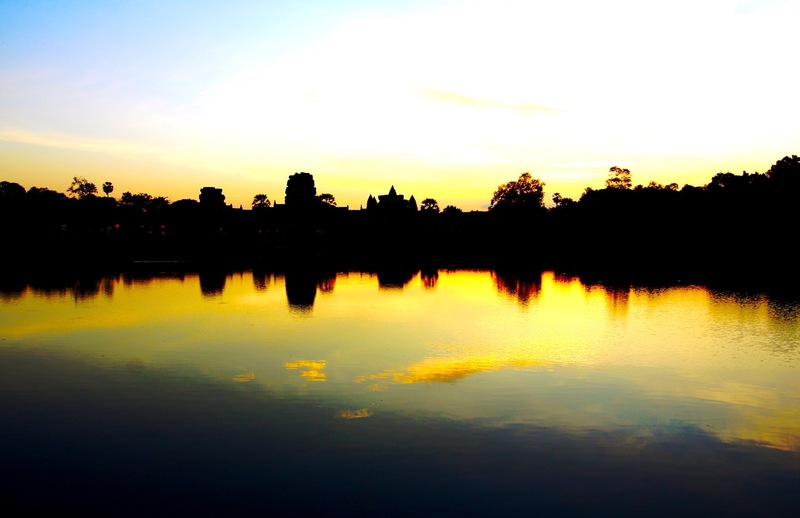 My first glimpse of this beauty called Angkor Wat was in the falling light of evening sky, the shadowy outlines of the magnificent architectural wonder, I have been waiting to see all my life. 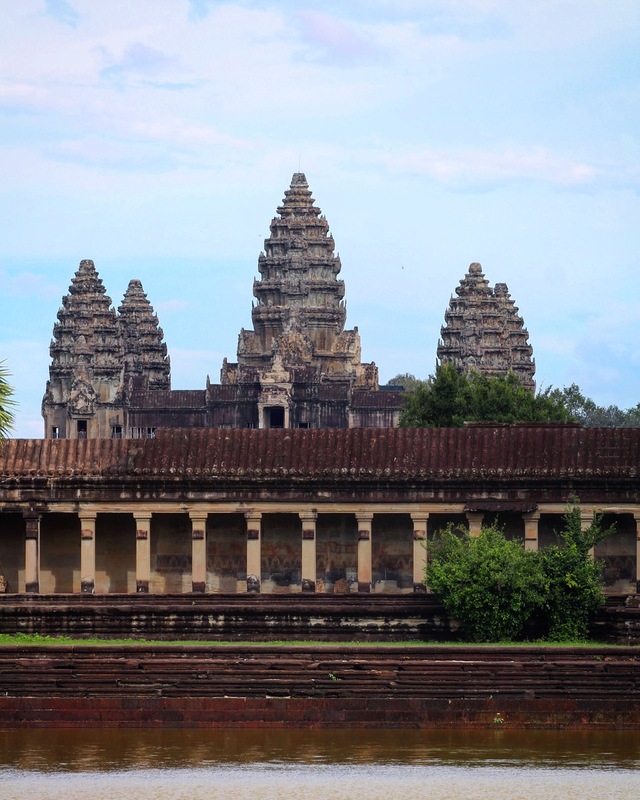 Angkor- built between 802 and 1220 AD, is the symbol of mankinds most astonishing architectural achievements. This is from where the Khamer kings ruled their vast empire spread from Vietnam to China till Bay of Bengal. The Angkor complex comprises of more than 100 stone temples and their arrangement is based on an astronomical alignment, the stars in the constellation of Draco during spring equinox in the year 10,500 BC. Angkor Wat temple was built by Suryavarman II, dedicated to Bhagwan Vishnu, a symbolic representation of Hindu cosmology. 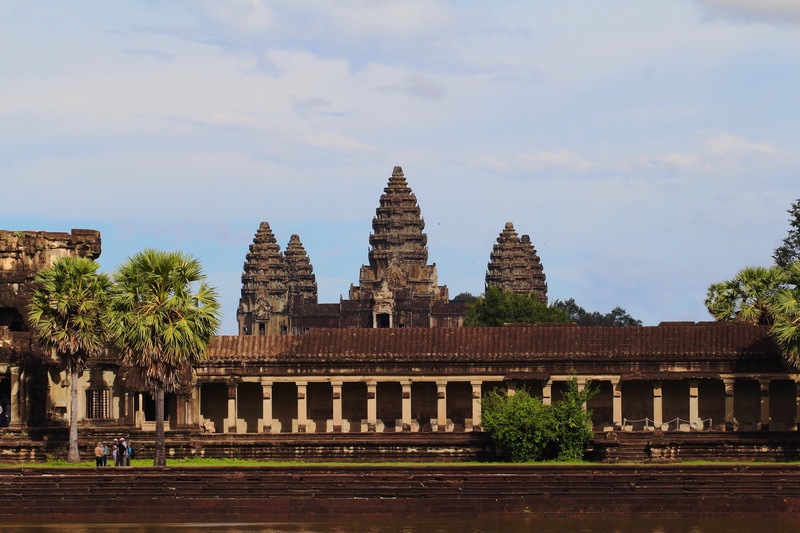 Architecture of Angkor Wat draws inspiration from Hinduism and is structured according to Hindu cosmology. City of Angkor was built around a central temple hill which represents mount Meru with its five peaks. The outer walls of Angkor temple along with magnificent pillars represent the mountains that surround the cosmos. 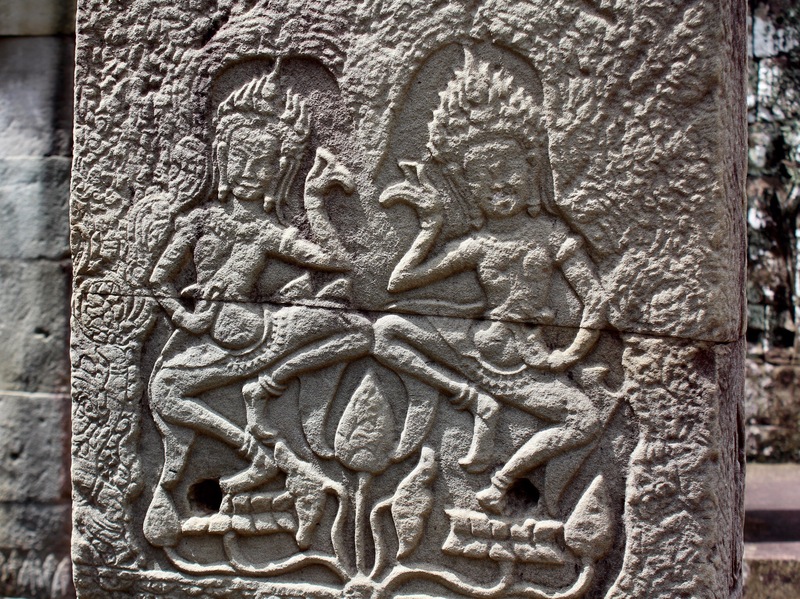 The walls of Angkor Temple are decorated with carvings depicting gods, apsaras, animals etc, with floral decoration for borders and capitals. The walls also have scenes from Hindu epic Ramayana and Mahabharata carved on them. 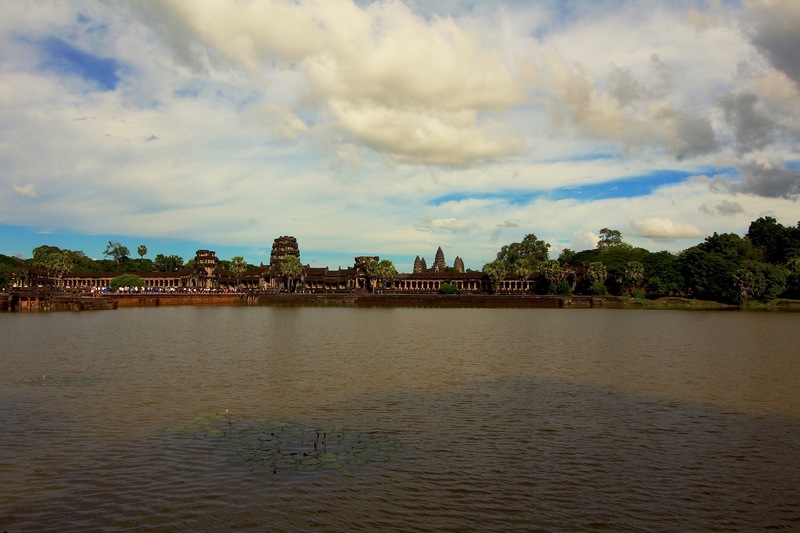 Angkor Wat temple constitutes two primary elements of Khmer architecture, pyramids and galleries. These pyramids are in the form of three stepped terraces and each step is encircled by galleries. What might appear to be a massive stone structure on one level with a long causeway leading to the centre, but as u come closer it is a series of elevated towers, covered galleries with intricate stone carvings, and well decorated porches, with courtyards on different levels and all connected through a network of stairways. 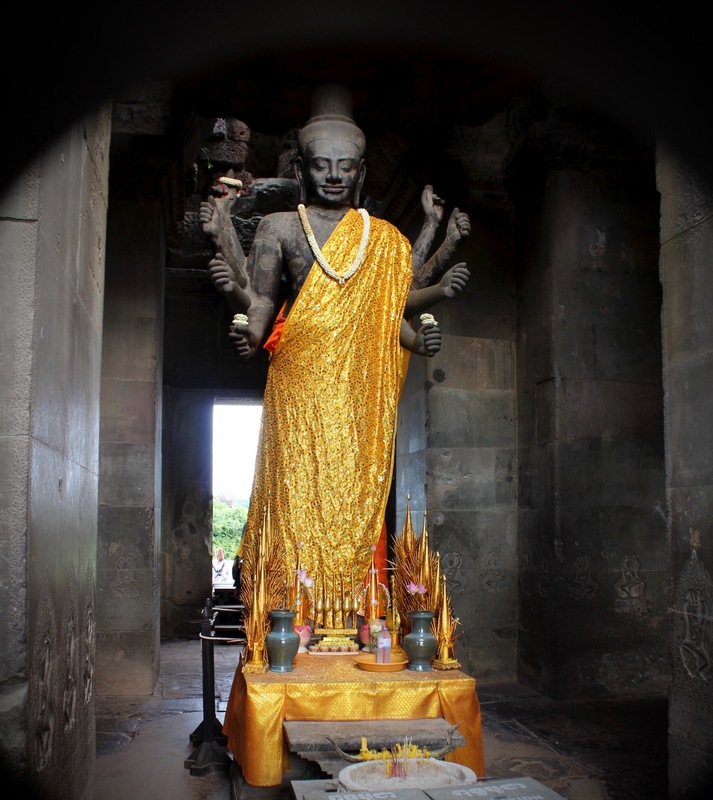 King Jayavarman VII brought Buddhism to Angkor and these once Hindu temples were converted to Buddhist places of worship. Though rest of Angkor complex temples were neglected and with time engulfed by dense forest, Angkor Wat temple continued to be a place of worship by buddhists. By the end of day one of my trip my body was totally exhausted though soul remained unquenched. I decided to head back to my hotel room. After a relaxing couple of hours sleep and a big mug of strong coffee I head towards the night market once again to sample local cuisine and pick souvenirs. Next day was planned to start with sunrise over Angkor Wat, but my previous days exhaustion was so much that I couldn’t wake up when I should have. Though late by 30 minutes I still rushed towards Angkor Wat to try my luck with sun god. By the time I reached, sun had already spread its first wing and smiling at me. has just dipped in water and its colours start finding their way till they all dissolve and be one. There’s a mesmerising rhythm in Angkor Wat, from the changing colours of the sky, to intricate wall carvings, to all the grandeur, and along with all of these is the swarm of tourists with their guides. Someone once told me, Sunrise at Angkor Wat is a spiritual experience, and when I saw sun rise from behind the “Mount Meru” slowly spreading light to the world, I felt numb and speechless, as if my soul was somewhere higher up than where my body was standing. 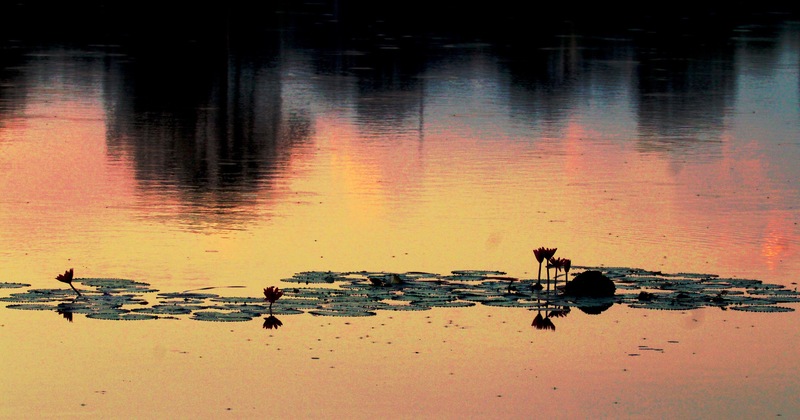 It was indeed a spiritual experience.. a beautiful sky filled with blues and purple, gradually turning red, and crimson hues, then there was the Angkor Wat silhouette reflected in the Lotus Pond, to me that was my moment of Nirvana. Temple structure illuminated in morning sunshine and the light reflecting on the lotus pond, I had to tell myself again and again “its real”.